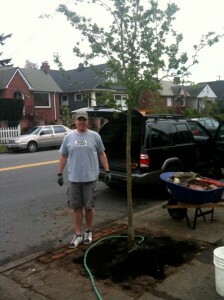 It’s great when a satisfied customer sends us a picture of their newly planted tree from Urban Forest Nursery, Inc! Here is an awesome example of beautifying an otherwise bare and boring strip of land between sidewalk and street. This is a Crimson Cloud Hawthorn and will have gorgeous bright reddish pink flowers with white centers. And the best part…the form! It is one of those trees where the branches grow in a somewhat irregular but symmetrical pattern, giving it an almost whimsical appearance. I have one in my backyard, and I can honestly say it’s one of my favorite trees. A great side benefit…the fragrance of the flowers in the spring is amazing!